Cyrtodactylus myintkyawthurai. A new species of gecko discovered in Myanmar. Photo courtesy of Robert Espinoza. Herpetologists – scientists who study amphibians and reptiles – are tasked with being highly observant of their surroundings when exploring new regions. By looking up in trees and searching in caves in the tropical regions of Southeast Asia, California State University, Northridge biology professor Robert Espinoza and his colleagues have “described” three new species of bent-toed geckos they discovered last November in Myanmar. On his recent trip to Myanmar – a country known for its beaches, diverse religious practices and growing tourism – Espinoza’s team searched less-visited locations and found many animals that were new to science. Among these new species was a crocodile newt – a type of salamander – which was also recently described, and several house geckos, which are in the process of being described. 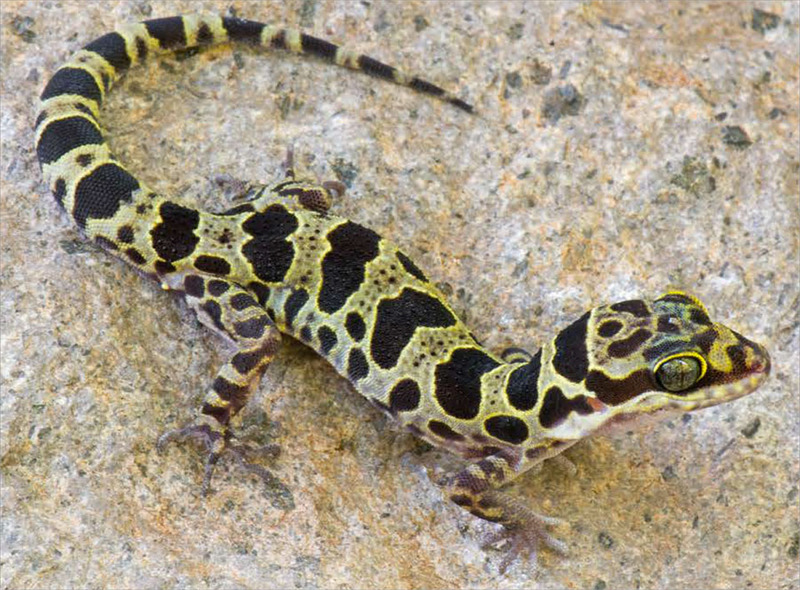 Espinoza was part of an international team of eight scientists, organized by Lee Grismer, professor of biology at La Sierra University, which led to the discovery of the new bent-toed geckos, which belong to a genus with more than 260 species. Espinoza said geckos are among the most diverse lineages of reptiles, and they possess unique traits that distinguish them from other lizard groups. The new species the team found in Myanmar share the bent toes as a distinguishing feature of the genus, along with unique body patterns that frequently include colorful bands. Espinoza has done fieldwork and described about a dozen new species of lizardsin Argentina, since 1994. He, along with colleagues, study how these lizards diversify and evolve over time. Instead of lifting rocks like he was used to in regions in Argentina, where he has conducted research for 24 years, Espinoza’s team found success exploring the caves of Myanmar. The team searched caves that had entrances barely large enough to crawl inside, while others were large and cavernous reaching over 300 feet in length. Inside they were “cool relative to the outside forests, and very humid. Many had water dripping from the ceilings and puddles of mud on the floors. “The team often encountered large rock-dwelling spiders, bizarre-looking camel crickets, and occasionally bats. Espinoza takes a specific interest in the evolution of lizard species that he has studied in Argentina. Some include lizards that thrive at elevations over 15,000 feet and give birth to live young, as opposed to laying eggs. He is also fascinated by a small percentage of these lizards that have evolved to eat plant matter instead of bugs. Espinoza said he plans to do more field work next summer to understand how a species of lizards in Argentina evolve to “color match” — evolve body colors to match with local soil colors over time — with fellow CSUN associate professor of biology Jeanne Robertson.